Brief Synopsis – A struggling playwright in New York in the gangster era tries to get his masterpiece play produced on Broadway. My Take on it – This is a film that I never had much interest in seeing. On the one hand, I’m a fan of Woody Allen’s films, but unfortunately, they all seem too similar sometimes and they lack a unique feeling. This film thankfully works much better than not and it largely has to do with the witty and clever dialogue by Allen himself. The lines are given to us in a rapid fire motion which helps make things move along really well. The cast is perfectly chosen here and the fact that 3 members of the cast got Oscar nominations for acting says a lot about the way they play their performances. 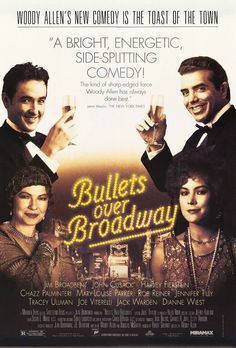 Jennifer Tilly, Chazz Palminteri and Dianne Wiest all were nominated with Wiest winning her second Oscar for a Woody Allen written role. The characters are all written really well and they manage to keep things entertaining and humorous the whole time. Unfortunately the story itself drags a bit in the middle yet somehow manages to recover by the end of it all. Bottom Line – Typical Allen fare that works more than not. The dialogue is superbly written and the rapid-fire way that the film moves along is great. The cast is perfect here and it’s no surprise that 3 cast members got Oscar nominations for this film. Allen does a wonderful job keeping the characters interesting the entire time. The film drags a bit in the middle, but manages to recover nicely by the end. Recommended!